Esri’s ArcGIS Runtime Software Development Kits (SDKs) support developers who build focused mapping applications for today’s modern computing platforms. Redlands, California—Esri updated its ArcGIS Runtime Software Development Kits (SDKs) with improvements that will help increase your productivity. ArcGIS Runtime SDKs run on all major platforms and now have offline functionality. These SDKs provide tools for developers to embed mapping into existing applications or build native, focused client applications for desktop and mobile. For easier access, developers can now download ArcGIS Runtime SDKs from one central location at the ArcGIS for Developers site. The site hosts ArcGIS for Runtime for a variety of platforms, including iOS, Android, Java, Mac OS X, Windows Presentation Foundation (WPF), and Qt. A beta version of the ArcGIS Runtime SDK for .NET is also available. 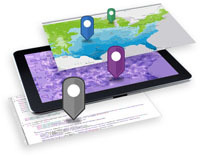 Offline functionality is now available in ArcGIS Runtime SDKs. This includes working with content like basemaps and operational data locally on your device when network connectivity is poor or nonexistent. Developers can implement offline capabilities in their custom apps for searching, feature editing, geocoding, routing, syncing, and downloading basemap tiles. Significant documentation improvements have also been made in the latest release. Esri created easier browsing pathways and added new topics to its redesigned documentation. All help information is in one place, making it easier to find answers to all your questions. Developers can get their app to market quickly using the same development and deployment model across all the Runtime SDKs with unified licensing. You can download any of the Runtime SDKs at no cost and will have access to Basic and Standard functionality for development and testing purposes. To deploy your app for offline use, you must license your application at the Standard level. For more information on ArcGIS Runtime SDKs, visit esri.com/runtime.